I’m back! I hope you had a wonderful holiday; so wonderful, in fact, that you’re scratching your head at that “I’m back” comment because you didn’t even notice I was gone. 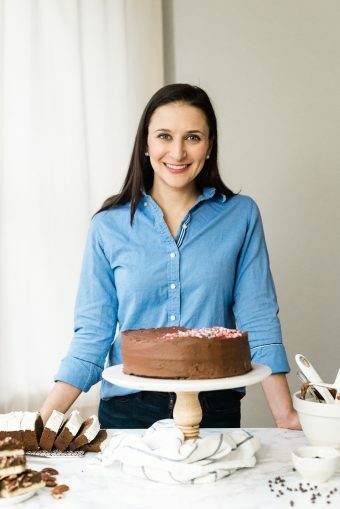 I decided to take the week off, but calling it a decision might be a bit of a sugar-coating since I basically crashed after too many weeks of doing too much and sleeping too little and it was all I could do to get through the day – forget cooking. Priorities shift during the holidays, don’t they? I just wanted to relax and drink tea and clean my house (temporarily trashed from a supposed-to-be-small construction project) and cook and bake for the love of cooking and baking, rather than to post about it. No offense, of course. But I needed a break. We all do, sometimes. Granted, if I had had my act together a little bit more, and maybe also had a little more sleep and a little less grime covering every surface of my home, perhaps I would have shared them in time for your Hanukkah dinner. 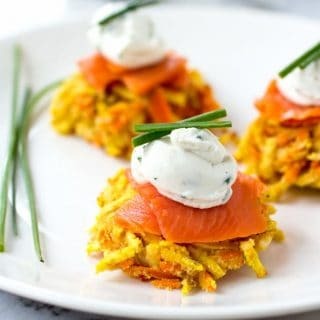 They’re certainly not your traditional latke, so feel free to make and eat them any time of the year, not just on one of those Eight Crazy Nights, and – topped with smoked salmon and chives – everyone will be impressed at your rustic and creative interpretation of the traditional blinis with smoked salmon. It would be terribly appropriate, for example, to serve at a New Year’s Eve party as both a sophisticated hors d’oeuvre and a sturdy base to absorb the alcohol. You can make the goat cheese ahead of time and store it in the fridge, bake the latkes instead of frying them (so they can be kept fresh in a warm oven; see instructions in recipe notes), and assemble these at the last minute for party guests. Or, make them for yourself as a carby-yet-healthy comfort food on a cold winter night. Now that the holidays are (nearly) over, what else can we turn to besides carbs to get us through the next 3 freezing months!? 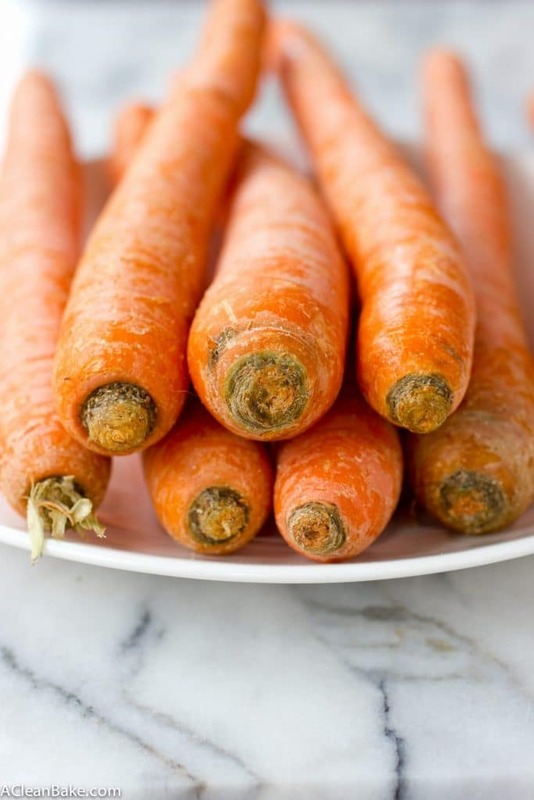 In a large bowl, toss together the shredded potatoes, carrots and onions. Stir in the salt, pepper and coconut flour, then fold in the beaten eggs. Add about 1/4" worth of oil to a large skillet and preheat until a single shred of the veggie mixture sizzles energetically as soon as you drop it in. Scoop the mixture out in heaping 2-Tablespoon portions and pack together into a tight ball, then flatten slightly between the palms of your hands to form a disc. Drop the disk in to the hot oil and repeat, quickly, until the skillet is full of discs with a minimum of 1/2" between each. Cook, uncovered, until the bottoms of each latke turns deep golden brown, then flip and cook until the other side is the same color. Remove cooked latkes from the pan and allow them to cool and drain of excess oil on a large plate covered with 4-5 layers of paper towel. Repeat the process with the remaining mixture until all the latkes are finished. Prepare the goat cheese by whipping it in a food processor or stand mixer for about 30 seconds until smooth. Turn off the machine and add the pepper, lemon juice and salt and process for another minute or two until light and fluffy. Use a spatula to fold in the chopped chives. 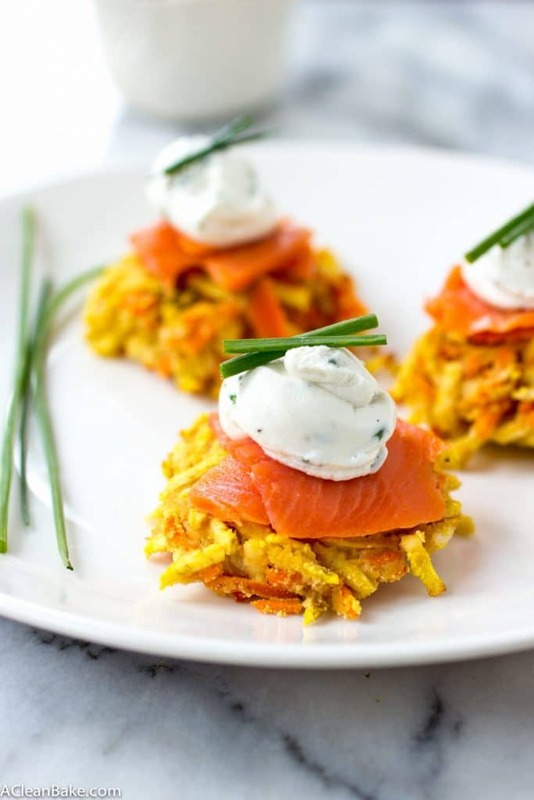 To assemble the latkes: layer a few slices of smoked salmon on top of a latke and spoon or pipe a dollop of goat cheese on top of the salmon. 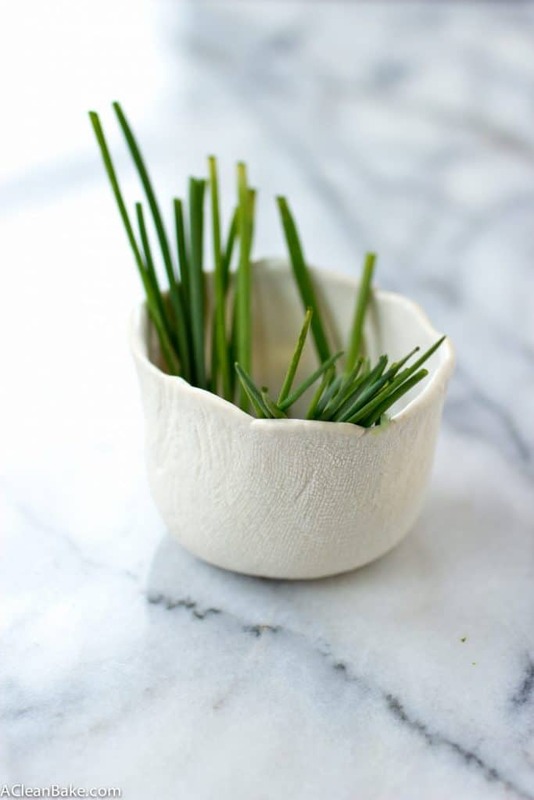 Garnish with a few sprigs of chive. Goat cheese is a lower-lactose (read: easier for your body to process) alternative to cow's milk cheese that seems to be ok, occasionally, for those who don't have a serious lactose allergy. Take that promise with a grain of salt because I have only really tested the hypothesis on a patient population of one (uh, me). So, skip it if you're nervous, or replace with ricotta if lactose isn't an issue but cost is. I used white sweet potatoes, but this would work just as well with the regular ones. Also, you can use all carrots or all sweet potatoes if that makes grocery shopping easier. Skip the salmon to make this vegetarian. To bake these instead of frying them, preheat the oven to 350 and line a large cookie sheet with a nonstick pad, or greased layer of foil. Portion the mixture onto the sheet the same way you would into the pan and bake for 18-25 minutes until golden brown and firm. The baked version doesn't develop a crust or hold together quite as well as the fried version but still tastes wonderful. Omit the goat cheese (or replace it with cashew cream cheese) to make these Whole30 compliant. You know I thought i would be all over the kitchen like a little duracell bunny cooking non-stop this holiday season but it was so busy I was more than happy to get loads of food cheats. These look so lovely and light, perfect after all the eating i’ve done last week. I was in the same boat..totally crashed and decided to relax for a week. Was great!! These are perfect little bites!! I’m thrilled that you got a chance to rest and relax after a busy year! I don’t know how you stay on top of everything AND do it so well. You amaze me! I’m so glad you’re back! I swear I checked your site pretty much every day last week and I was wondering where you were. Can I just say how much I love these photographs?! That carrot picture is gorgeousssss like seriously. And the chive picture? I want (read: need) that jar that they’re in- please tell me you bought it because if you made it, then I’m totally jealous of your artistic abilities! And, finally (sorry for being way creepy here and fawning all over you haha) I love these latkes- I’ve been dying to make some for the longest time and I think your recipe is the one I have to try because sweet potatoes and smoked salmon? Droooooling. Ahh you are so sweet! To be honest, I had planned to post and then…. crashed. A lot harder than I thought I would. Oh well! The best laid plans, right? How was your holiday? And oh my gosh THANK YOU for all your kind words! I really can take precisely 0 credit for the photos – it’s all thanks to a new lens I got for Christmas! The bowl was a gift from my uncle that I “borrowed” (aka stole) from my mom so you’re going to have to fight her for it! It’s from a tiny little store in Connecticut, probably by a local craftsman. But I’ll bet you could find something similar on etsy 🙂 But ok, let’s be serious here: MAKE THESE! My husband, who is usually a reluctant taste tester, devoured these and asked for more. I had this batshit crazy idea in my head and I can’t believe it actually worked out. Also, for the full experience, fry them because, well, what isn’t better fried rather than baked? Let me know if you try them! Happy new year!! What a creative idea to make little latkes.. I definitely will be making these tomorrow for NYE! I totally feel you on cooking for the sake of cooking! It feels like such a treat sometimes! These latkes are definitely year-round food. So cute! Isn’t it a treat!? Getting in to this blogging thing, you don’t expect it to become such a job and when it does and you get to cook without testing/photographing/etc, it’s a bit of a relief sometimes 🙂 Happy new year, Joanne! And congrats on your wedding!